Do you have an issue at home or work relating to dust, excess moisture, and allergens, such as mold and mildew? If so, the Hodgson Auto Small Dehumidifier can rectify all these problems and more. For bathroom, basements, bedrooms, living rooms, kitchens, boardrooms, offices, and other 200-square-foot areas, this is an incredible product. Let’s get into this Hodgson Auto Small Dehumidifier review. Just because the Hodgson Auto Small Dehumidifier is compact, do not discount its capability. For rooms of 200 square feet or less, this unit with thermoelectric technology is nearly impossible to beat. Even after operating this dehumidifier continuously for 24 hours just once, you will find the results astounding. The Hodgson Auto Small Dehumidifier is the ideal choice for anyone struggling to eliminate musty odors, excess moisture, mold, dust mites, and bacteria. Because this unit removes airborne contaminants, thereby improving indoor air quality, it works great at creating a healthier environment. It is especially great for people with allergies and upper respiratory illnesses as breathing clean, fresh air, prevents allergy triggers. Environments with moisture and high humidity serve as perfect breeding grounds for dust mites, mold, and fungus. If not quickly controlled, these organisms start growing on virtually any surface, including furniture, artwork, carpeting, draperies, luggage, and even shoes and clothing items. Moisture also encourages the growth of bacteria, making people with upper respiratory conditions more susceptible to infection and other illnesses. Fortunately, the Hodgson Auto Small Dehumidifier eradicates all these contaminants. Even if your goal is only to achieve a cleaner and fresher home or work environment, this dehumidifier is perfect. As the unit operates, it improves indoor air quality. Compact Design – This product measures just 6.4 by 4.2 by 10.2 inches and weighs only 2.2 pounds. Not only can you carry it from one location to another with ease, you also can place it discreetly on countertops, bookcases, fireplace mantles, and more. With its unique design, you can place this dehumidifier flat against walls. With a clean and sleek aesthetic, it fits in perfectly anywhere. Since this comes with a 5 foot adapter cord, you can be assured that maneuverability won’t be an issue. Efficient – Given the fact is runs on 21 watts of electricity and removes 300 milliliters of moisture per day, makes this one of the best small dehumidifiers. Capacity – The Hodgson Auto Small Dehumidifier features a 26.7-ounce (700-millimeter) removable water tank. 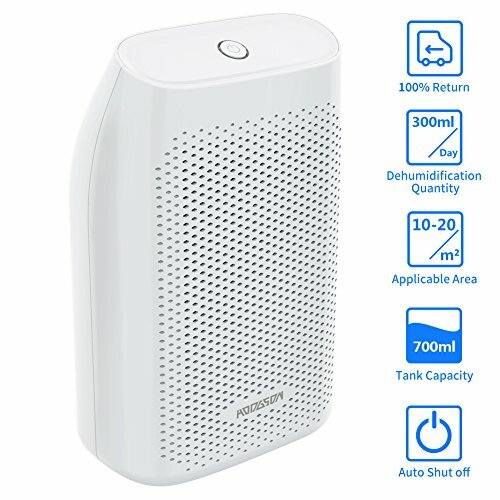 Multifunctional – In addition to eliminating dust mites, musty odors, mold, and various other airborne contaminants, this compact dehumidifier reduces humidity. As a result, it keeps wood furniture and furnishings, linens, and clothing dry. Quiet and Energy Efficient – Even when running the Hodgson Auto Small Dehumidifier 24 hours a day, you never have to worry about its operation disrupting conversations, stereo music, or television shows. 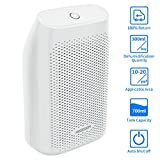 With the Peltier electrothermal technology and unique dense grilles, this compact dehumidifier condenses 50 percent faster compared to similar dehumidifiers on the market today while running incredibly quietly. Easy Controls and Safety – With its uncomplicated design, you simply turn the machine on, and when the tank fills, it shuts off automatically. Warranty – The manufacturer of the Hodgson Auto Small Dehumidifier provides a 24-month warranty period. During that time, the company accepts free returns and exchanges. Operating this dehumidifier involves nothing more than plugging it in and pressing the on button. Once the tank fills, the indicator light turns yellow, followed by the unit shutting off automatically. When finished, dump the water and replace the tank; it will be ready the next time you need it. Although this compact dehumidifier works incredibly well for smaller areas, you would need a larger unit when dealing with more square footage. In that case, you have an abundance of alternatives, including the Whirlpool 50-Pint Portable Room Dehumidifier. In addition to covering 1,000 square feet, it offers a trouble-free drain connect and quiet operation. This product is also Energy Star certified, meaning it consumes little electricity. This is definitely a viable option for vehicles with 110-volt outlets, such as cars, trucks, SUVs, travel trailers, RVs, boats, and more. So if you’re looking for a compact dehumidifier with a sleek design that looks great anywhere, the Hodgson Auto Small Dehumidifier is worth it.